Enable mobility and maintain control with FileOpen portable document security. Your colleagues and end-users need access to your documents on-the-go, from anywhere, and increasingly from their personal smartphones and tablets. This poses a challenge for businesses that wish to support document access on mobile devices, but also need to maintain control over high-value documents. 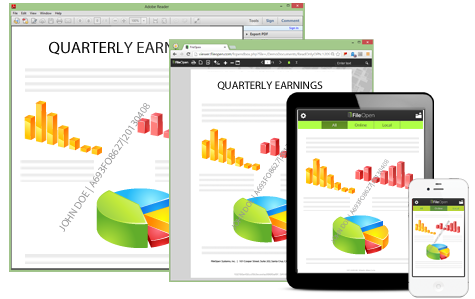 FileOpen rights management solutions allow you to publish to mobile devices such as the iPad, iPhone, and Android without sacrificing security or usability. The FileOpen dashboard makes it easy to allow or disallow specific devices, and change permissions for those devices even after a document has been delivered.